First of all, do you love the vintage pic? Doesn’t it look like I’ve just dragged it out of a box in the attic? In fact, I’ve just bought a photo app for my iPhone – ‘Hipstamatic’, since you ask! Needless to say it has joined the long line of things I waste time on when I should be working but the crumpled, family-album vibe fits very well with today’s post as I’ve been rummaging through old cookbooks in search of unusual recipes to make use of all the wonderful soft fruit in the Delhi markets at the moment. There are a couple of books that I would brave a burning building for – one is my Mum’s handwritten recipe journal which tells the food story of my childhood. 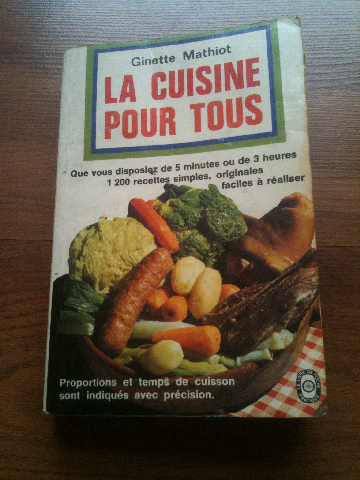 The other is a 1955 edition of ‘La Cuisine Pour Tous’, by Ginette Mathiot, the legendary French food bible. This was the first cookbook I ever owned and has been with me since I was a student in Paris . This is the book I turn to when I want to know the right way to do things and is particularly dear to me as it was given to me by my old friend Marie-France with whom I lodged as I worked my way through the repertoire of local patisseries. It is a book, more a comprehensive cooking manual really, first published in 1933, that used to be given to all young French housewives and was largely responsible for keeping French home cooking alive for so long. When I returned to Britain, this book was my secret weapon in the kitchen, a book I could be certain almost no-one else had. Until recently, that is. Last year, Phaidon Books decided to give it big, fat glossy, english-translation makeover, adapted by Chocolate and Zucchini’s Clotilde Dusoulier. And now everyone knows the secret of my delicious Quiche Lorraine! I bought a copy of ‘I Know How to Cook’ (how could I not?) but do you know what, I still prefer taxing my rusty French with the original. I love its utter unpretentiousness, the dearth of pictures, the directness of the instructions; I love the fact that there are up to 10 recipes crammed onto a page and every one a gem. Many of Ms Mathiot’s recipes are staples in our home but every time I turn to it, I find something new. 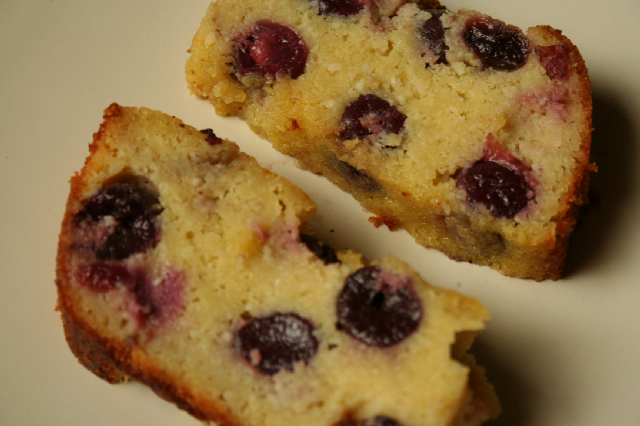 This week, I found a Gateau de Cerises (Cherry Cake) and can’t believe I’ve never noticed it before. It’s a stunningly simple combination – just almonds, butter, sugar, eggs and leftover brioche. I could tell by licking the bowl it was going to be divine and it was utterly delicious – fruity, creamy, almondy butteryness doesn’t even begin to cover it. My eldest son had to be restrained from eating the whole thing in one go. Of course there’s the small matter of making some brioche the day before but I urge you to give it a go – you’ll be the most popular person in the house for 2 days running. Win-win! Melt the butter – Ms Mathiot says ‘au coin du feu’, in the corner of the fire, but I think we can safely substitute the microwave. To the melted butter add the sugar, salt and ground almonds. Beat well to mix. Put the brioche in the milk to break it up then mix it into the butter mixture. Beat in the eggs one by one then mix in the cherries. Butter a tin (it should be a Charlotte mould but I used a deep rectangular baking tin) then pour in the mixture. Bake for 30-45 minutes until a skewer inserted into the middle comes out clean. The Gateau should be served cold, sprinkled with Kirsch but we couldn’t wait and it was pretty good warm too. ‘I Know How to Cook’ by Ginette Mathiot is available at CMYK books in Meher Chand Market, Delhi but please, I beg of you, don’t all rush out and buy it – I’ll never be able to invite you to dinner ever again! Wowwwww! Never baked one substituting flour with bread, this sounds very very interesting. 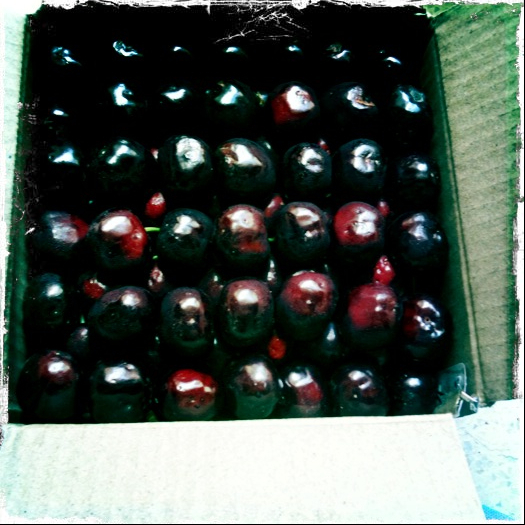 Can you suggest any local substitute for black cherries. Thanks for sharing this gem from a book/ memory that’s you so cherish. Lovely story Pam! First cookbooks are always special……such fond memories associated with them! 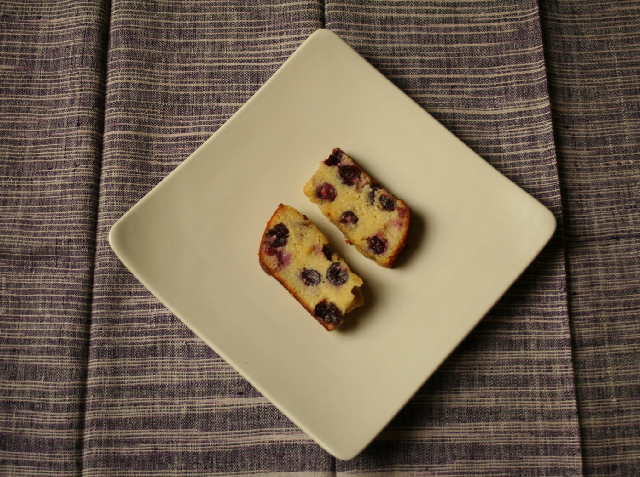 also love the idea of using leftover brioche to make a cake! I am an amateur baker myself ( my friends think otherwise), and I lovee your blog. This recipe looks very interesting. What else can be used instead of Brioche? Kiran – thanks and haven’t forgotten about Quiche Lorraine! Thanks Vivek – you could try using some good quality bread instead of the brioche. Good luck! Apeksha – and it tastes as good as it sounds! I would recommend the semolina cake reciep, especially if you cook it in a caramel coated mould.